Once a rental account becomes overdue, it will generate a letter OverdueR1. If the account isn’t paid by the next month, it will roll over to OverdueR2, third month of not paying it will generate OverdueR3 and then after the fourth and final OverdueR4. The account will not advance from OverdueR4, and if a payment is made, then this will reset the account back to OverdueR1. 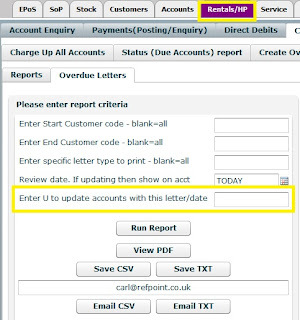 To create the Overdues list, and the letter, select Rentals/HP, ChargeUp and Overdues, Create Overdues File. 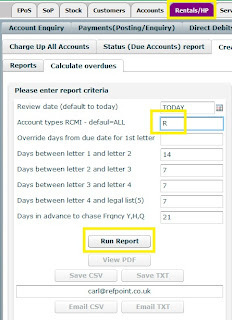 Select Create new overdues list. Set the Account Types RCMI to R just to pick up the Rentals (Having RCMI will include all Rentals, Credits(HPs), Maintenance and In-store agreements). Select Run Report. To review the letter list (there might be some accounts you might not want to send a letter to), Rentals/HP, ChargeUP and Overdues, Edit Overdues File. Select Search. Select as any accounts you want to remove, and select DELETE. These will not affect the accounts, just the letter list, so running the above create letters, will recreate these entries. To print the letters, select Rentals/HP. ChargeUp and Overdues, Letters/List. Select Overdue letters. 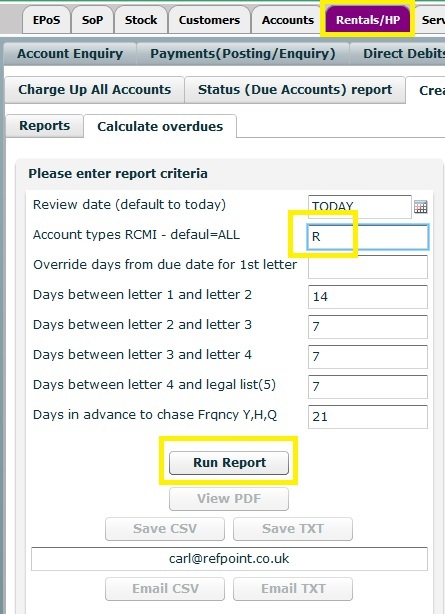 If the system has to generate a lot of letters, than there is an option for running the Letters in a customer range. 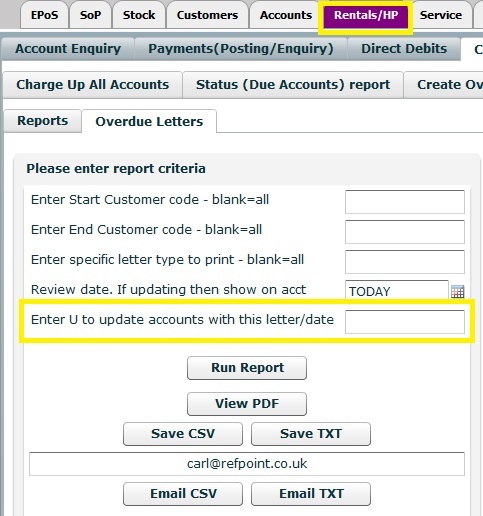 Leave the Enter U to update accounts with this letter/date blank, and this will not update the account, which is useful for checking that the letters are all ok, then once the letters have been checked, re-run this process and put a U in this option and the system will mark the account with ‘last letter / date sent’, and will know the next time they are overdue to roll over to the next letter type. Select Run Report, then View PDF. This will produce the letters.